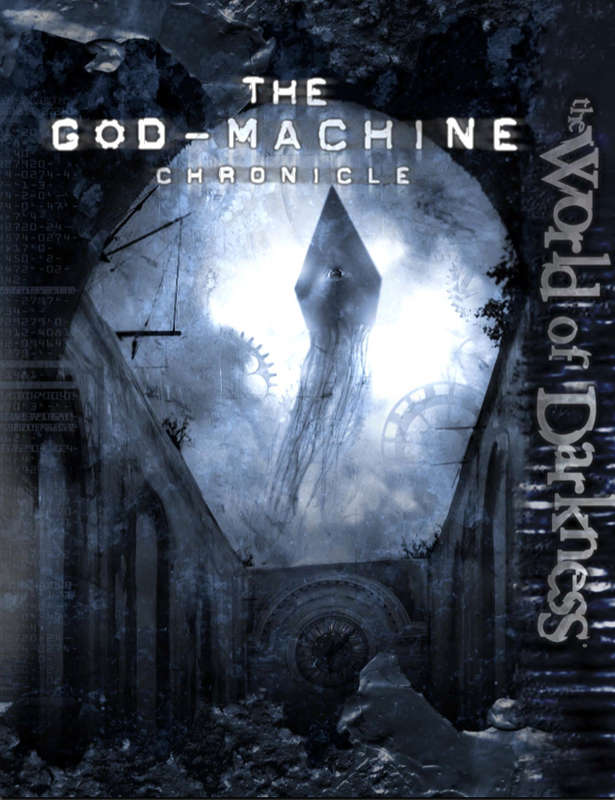 Cover of the God Machine Chronicle for the World of Darkness Role Playing Game. I recently bought the PDF version of The God Machine Chronicle for the World of Darkness role playing game after hearing how the setting and ideas were along the lines of weird science fantasy. I’ve just been skimming through it, but from what I’ve seen so far, I’m really enjoying it, especially the second chapter titled Tales of the God Machine which details 20 (!) spectacularly supernatural and weird adventures. But before I get into that chapter, I want to explain the insane, but fantastic idea of what the God Machine is. The beginning of the book gives you a small taste of what it’s all about by way of a conversation with a woman emailing a friend about an online promotion to get free movie passes. The prologue ends with the increasingly worried friend writing a note to the woman about strange changes in his neighborhood, seeing kids being taken to a “camp,” his newfound paranoia of the Internet and hearing talk about a “machine” behind it all. The God Machine is a being that has a plan for everything, but no one except it knows the entirety of its schemes which can be of a grand scale to small meaningless tasks that may seem to be of no real consequence to anyone. The god’s power is felt everywhere, from earth to other worlds, alternate planes of reality and different periods of time. It cannot be reasoned with, and if you pose an obstacle in its path prepare yourself. Sometimes people become aware of the god through the discovery of “cogs of the God Machine,” which could manifest in different ways from a strange, mysterious wall to an earth shattering event that reveals an odd artifact. It is through those discoveries that players start adventures where (sometimes) over the course of sessions, the god is slowly revealed. The majority of humans don’t know it exists, even though it’s been a “silent manipulator” of history with the vast majority of humans acting as blind servants to its plans. As with other machines, there is a purpose for its existence, but people are not ready to understand its nature. And therein lies the basic idea of the God Machine. Although the book does not detail the inner workings or the true purpose of the god, it lays down possible explanations in the form of stories and myths about the god thereby keeping the god mysterious and avoiding any type of concrete path that the being (or GM) must follow. One of the God Machine’s angels manipulating human history in a battle. Excerpt from the God Machine Chronicle for World of Darkness. The chapter that I’ve been returning to consistently is the second one titled Tales of the God-Machine which has 20 short, but detailed adventures that revolve in some way with the god. The adventures include a mysterious room at a diner that can grant people a second chance to redo something in their past, a key that can open part of the god, an object uncovered by means of warfare, and a time traveling scenario where the players voyage to 1901 and destroy a device that will end the world. The players have a chance to stop (or may unwittingly help) one of the God Machine’s plans through the scenarios. All the wonderful and weird adventures in some way deal with the God Machine, and it’s pretty fun to read what’s going on behind all these strange happenings. The adventures are a mix of Call of Cthulhu and the Twilight Zone, where the PCs are confronted with unusual, paranormal scenarios with a mysterious antagonist that they may or may not realize. Aside from the different scenarios, I also like the way the adventures are neatly broken down to seven parts made up of the introduction, interchangeable parts, blueprints, linchpins, methods and escalation. The introduction is a pretty short teaser of the adventure and sets up in a sentence or two the gist of the adventure. The interchangeable parts is the way the players are introduced to the plot and what kind of connections they may have to NPCs or to the story itself. Blueprints are just that. They are the blueprints or plans of the God Machine for the particular adventure, and give background on not only the god’s intentions but any additional antagonists. 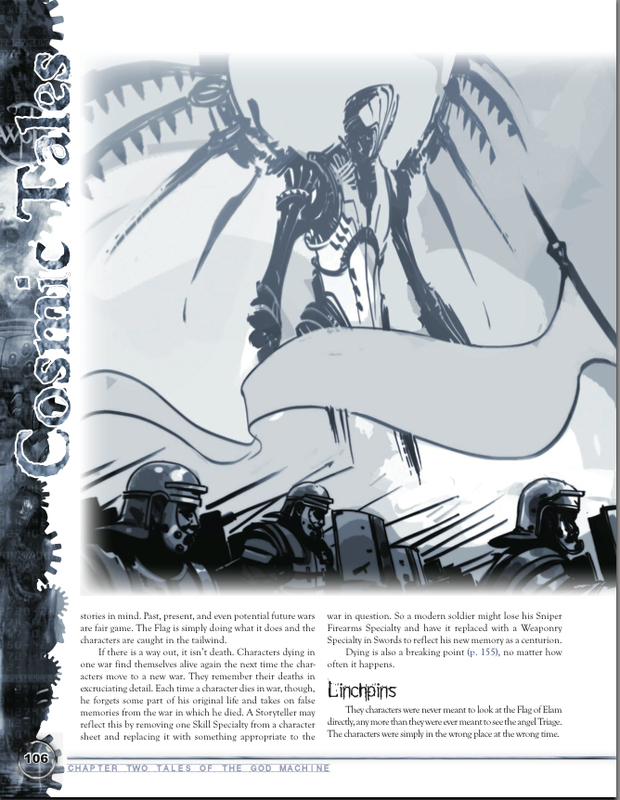 Linchpins is where signs of the God Machine in action can be seen and details its allies and their motivations. Methods is an outline of various skills that players may have that can be best used in the adventure. Finally, escalation is what happens at the end of the adventure, and what happens afterwards, giving suggestions on other adventures that could naturally tie in. You don’t have to play World of Darkness to enjoy these adventures as they can more or less, with some manipulation, be used in any type of science fiction world. There’s a lot of ideas that I’ve seen throughout the book that can be used for campaigns that would last for a good bit, and of course there’s the ultimate plot of using the God Machine as the cosmic being that’s manipulating mankind and who knows what else since the beginning of time for an end only it is privy to.